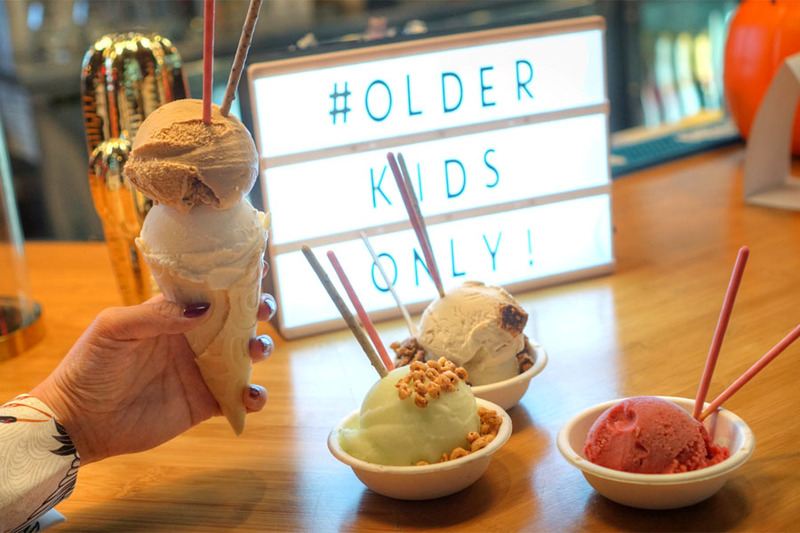 After dinner at ChiMac Star, we were in the mood for some dessert and thus moseyed on over to the new Beer Belly-adjacent Milk Tavern. 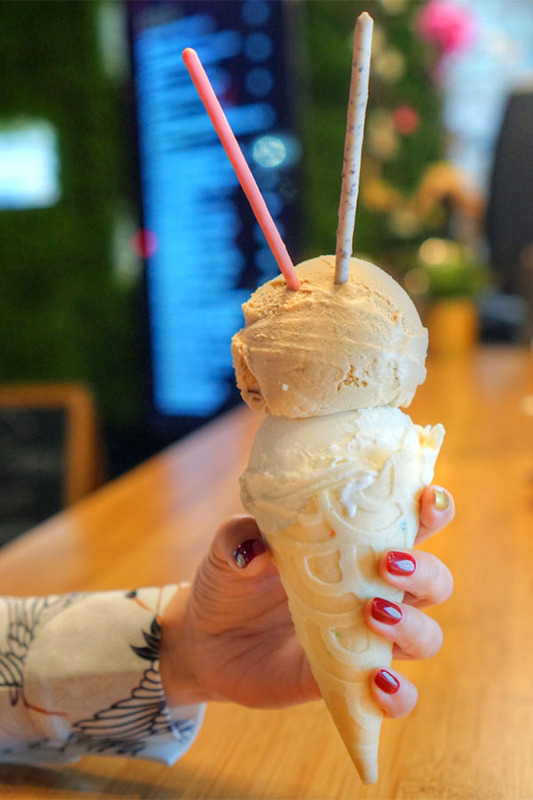 The spot opened in September, and is the work of Alex Dong Wook Sohn's ALMG Hospitality Group, the same company behind the Koreatown outpost of Dongdaemun Yeobgitteogbokki. 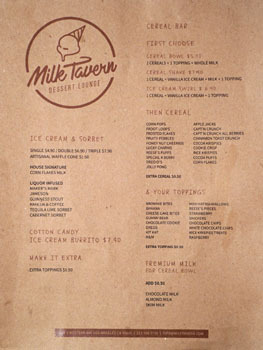 Milk Tavern takes over the building that was last home to the short-lived Horse's Mouth. The space retains the same basic layout and decor, though it's been made more lively by the addition of a ping pong table, board games, Nintendo, and a bean bag toss in the faux grass-covered patio (replete with inflatable flamingo). 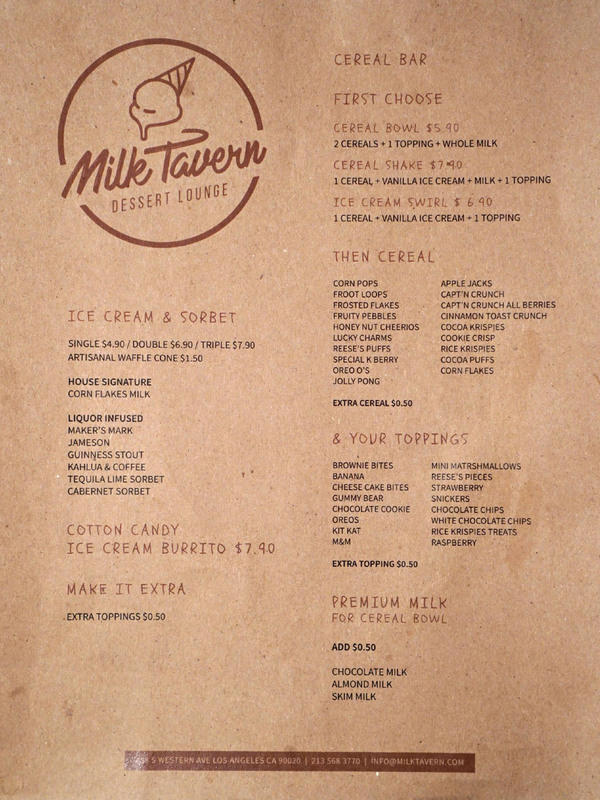 Menu-wise, you get 19 different cereals and numerous toppings, available in three formats. This is joined by alcoholic ice creams, which is more what we were in the mood for on this particular evening. 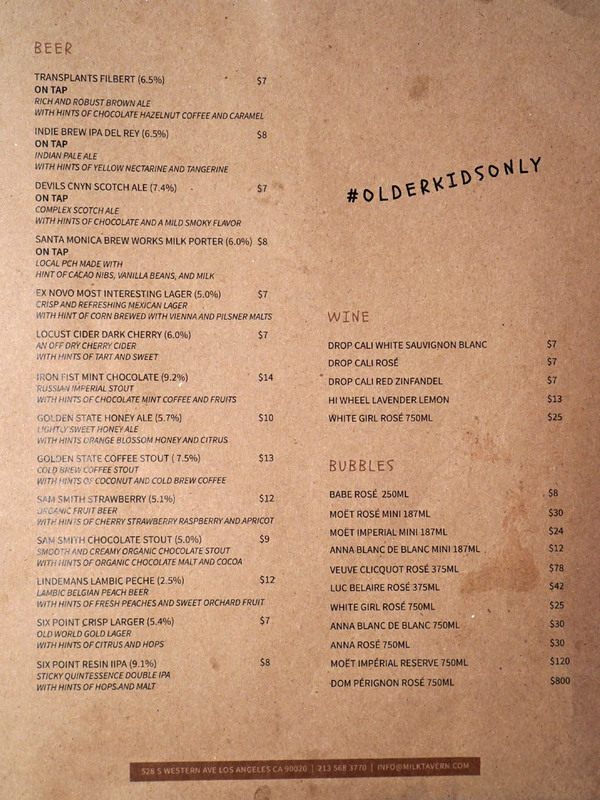 Beverages include a few easy-drinking wines, a range of bubbly, and a surprisingly good selection of craft beer (probably one of the better ones in K-Town). Do note that our meal ended up being on the house tonight, as we happened to run into a friend of the owner while waiting in line ("oh you know JT?"). Click for larger versions. 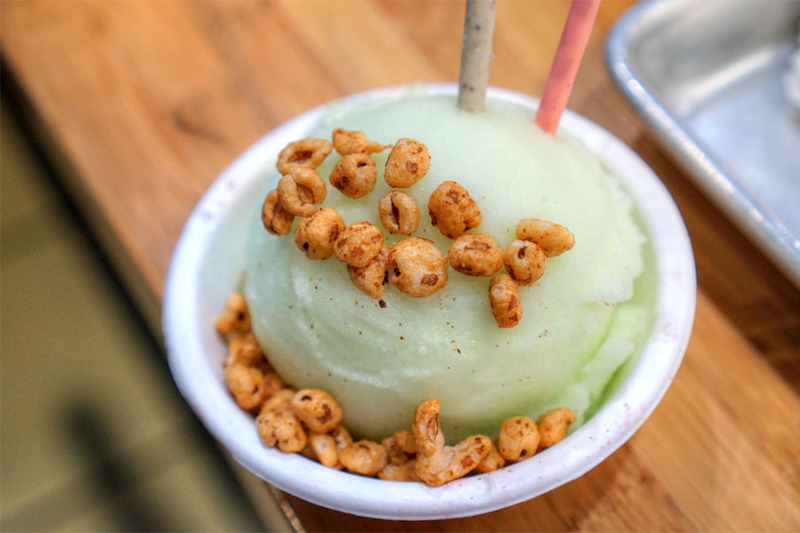 We began with this refreshing sorbet, which was almost like a frozen margarita. Think sweet 'n' sour, with a toasty, crunchy cereal counterpoint from the sprinkles of Jolly Pong (a puffed wheat snack). Next were scoops of Kahlua and Jameson served in what I believe was a fruity cereal cone. The Kahlua had some very in-your-face coffee notes, which I actually appreciated, and there was just the slightest hint of booze. The Jameson, on the other hand, was surprisingly delicate and fruity, with nary a trace of alcohol. 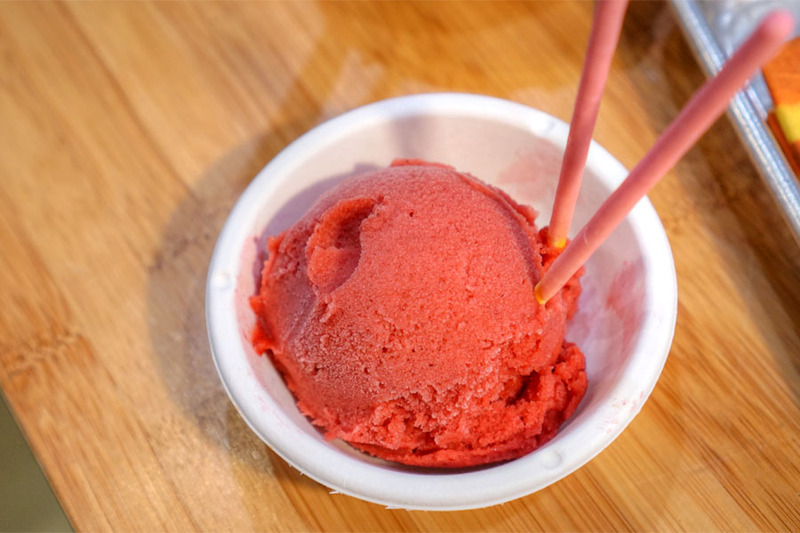 A Cabernet Sauvignon-infused sorbet was decidedly fruit forward, with some pleasant red berry flavors. Guinness gave our next ice cream a lightly roasty, malty quality. Meanwhile, the Maker's Mark version might've been my favorite of the bunch, with a lovely floral character and traces of black cherry. 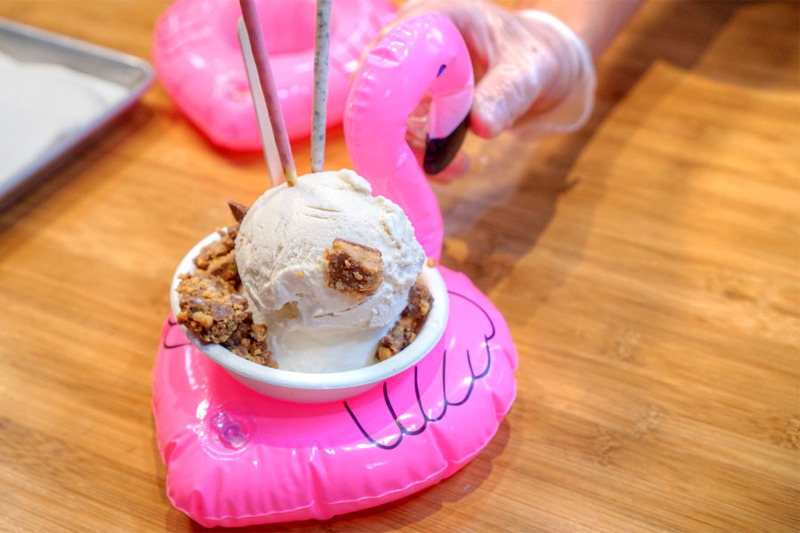 A (somewhat flaccid) flamingo ice cream holder for the 'Gram. Our overall spread. Milk Tavern even provides you with the proper hashtag to use. Speaking of Instagram, you'll want to make use of the new (faux) foliage-covered wall that was installed. Seen above is an off-menu item of frozen rosé topped with gold foil-dusted sugar crystals, which was as fun as it sounds. 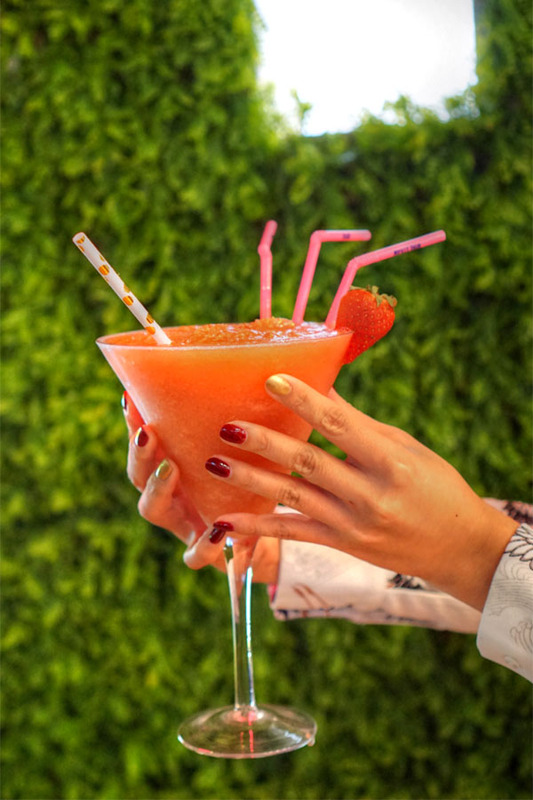 The slushy concoction showed off boatloads of strawberry, though you could still taste the wine, while the sugar on top added a sweet crunch to complete the experience. 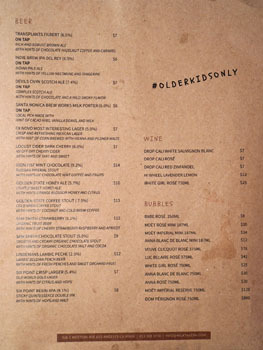 I was curious to see what would take over the old Horse's Mouth, and Milk Tavern seems like a worthy replacement. 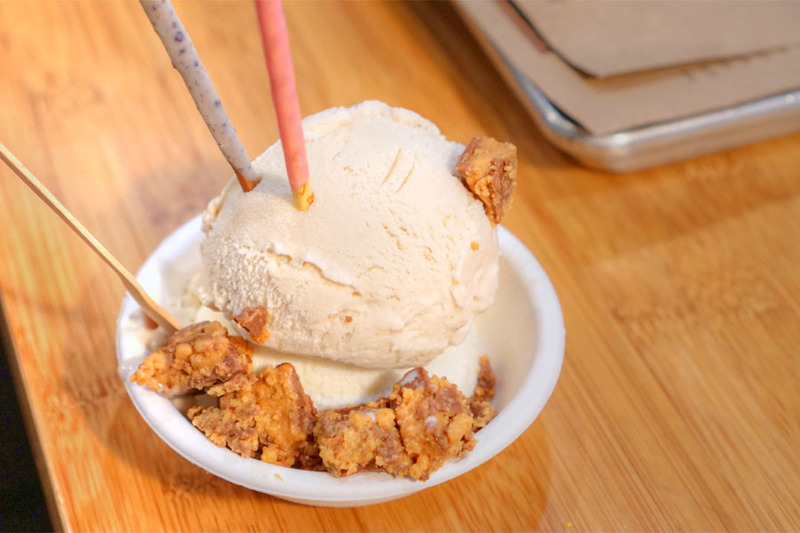 It's an entertaining spot, and the boozy ice creams are certainly fun. Next time I gotta come back and get my cereal game on, and perhaps try a beer or two, too. whoa, I haven't heard from you in a long time Mike. Yeah the "hand model" was just one of my dining companions, the one with the best nails haha.